The Chord Signature ARAY Power Cable is designed to work with all hi-fi and home cinema components. This power cable uses ARAY conductor technology to help improve control and definition throughout the frequency range. This cable is created using a combination of precision machine preparation, meticulous hand assembly and hand testing. Available in 1m, 1.5m and 2m lengths. The Signature ARAY power cable is our latest power cable. Its design has been influenced by the research that led to the newest version our flagship power cable the Chord Sarum Super ARAY. Not only is the cable a completely new design, so are the plugs. The UK mains plug has been custom made for us and features heavily silver-plated pins and a special cover that allows us to apply mechanical damping to the plug. Power cables are a difficult subject and perhaps mains plugs even more so. The fact is though, that every element within a power cable will have some influence on the performance of the equipment it’s used with. 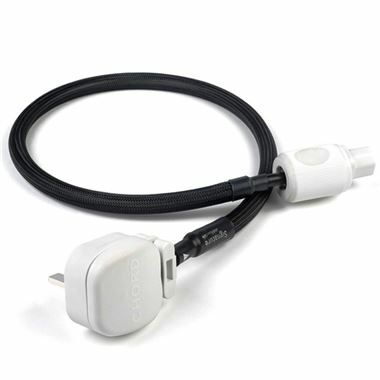 Back in 2005 when we produced our first power cable, the Chord Power Chord, we learnt that every aspect of the termination mattered. The way the internal conductors were routed, the type and the direction of the fuse and strangest of all, the degree of torque applied to the screw that secures the cover of the plug to the main body. All of this knowledge was put into the development of the Chord mains plug - the fuse chosen on the basis of listening tests, the silicone damping spacers experimented with in the demo room and the silver-plating chosen after listening to gold-plated, rhodium-plated and silver-plated prototypes. The same is true for the new IEC plug. This features sliver-plated contacts, produced from a heavier gauge of material. In truth, power cables are like interconnects. Pay attention to every aspect of the design and build, and all the things that on their own make small but significant improvements add up and allow us to produce something really special. The combination of new plugs and a new ARAY conductor configuration means that the Signature ARAY power cable has more than a taste of the performance improvements that the Sarum power cable is capable of. There is that same sense of noise you’re not aware of until it’s not there, disappearing and revealing a new layer of detail and dynamics.